Friday night was a great night to be a National Lacrosse League fan. The evening featured three games across the league that were all decided by a single goal. In Calgary, fans were treated to a barnburner that was ultimately decided by a late shorthanded goal from Curtis Dickson propelling the Roughnecks over the Georgia Swarm by a score of 14-13. After a short feeling-out process to start the game, the two heavyweights started to find their range. Calgary struck first, with a four-goal run to give them a 5-2 lead early in the second quarter. Unfazed by the deficit, the veteran Georgia team responded with a four-goal run of their own. The two combatants continued to exchange shots and when the dust settled, 18 goals had been scored and Calgary held a 10-8 lead at the half. After both teams made adjustments at halftime, the scoring pace slowed and the game developed into a strategic battle. As the score went back and forth, Georgia used their excellent ball movement to generate some terrific goals including two superb quick-stick finishes by Miles Thompson. 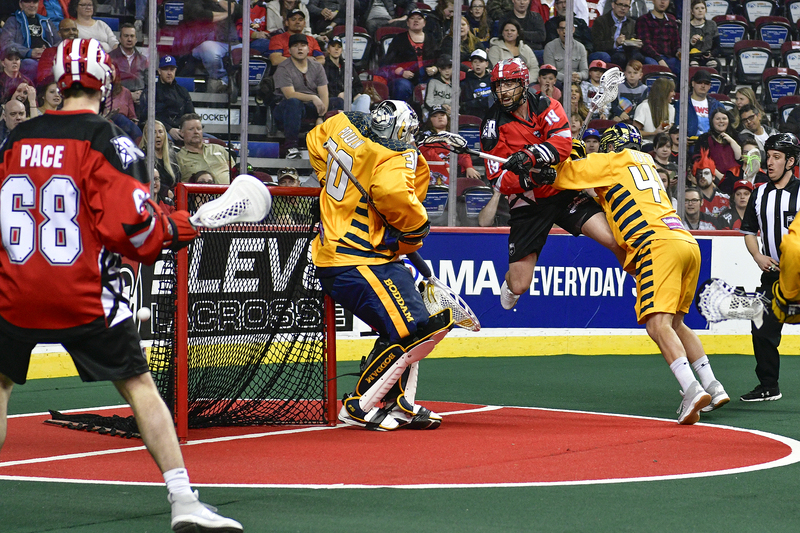 Calgary leaned on the NLL’s top scorer, Dane Dobbie, who added three second half goals. With only 3:06 remaining and the score deadlocked at 13-13, Calgary defender Curtis Manning took an illegal crosschecking penalty giving the 2nd ranked Georgia power play a chance to take the lead. However, following a terrific save by Christian Del Bianco, Calgary transitioned the ball up the floor and Zach Currier hit a cutting Curtis Dickson who beat Kevin Orleman vaulting Calgary into the lead. The last two minutes can only be described as pure heart-pounding action. Calgary managed to kill off the remainder of the Manning penalty, but promptly committed another infraction. With under 30 seconds left, Georgia pulled Orleman setting up a six on four power play. On a scrambled play, the ball eventually found its way into the stick of Miles Thompson who fired a shot that rang off the iron and ended the game. The players Comeau was referring to were forward Randy Staats and goaltender Mike Poulin. Staats took part in the pre-game warmup but was unable to suit up for the game. Then towards the end of the second quarter, starting goalie Mike Poulin suffered a lower-body injury and had to be helped off the floor. Kevin Orleman stepped in for Poulin and stopped 26 of 31 shots in the loss. One of the storylines that followed the game was the return of Jesse King to the Calgary lineup taking on the player he was traded for, Holden Cattoni. King fit in nicely on the left side and scored his first goal of the season on a nice inside move. Cattoni scored four times and added an assist giving him a career high 77 points. The other marquee matchup was the battle of the league’s top two scorers, Dane Dobbie and Lyle Thompson. Both players delivered MVP calibre performances with Dobbie registering four goals and four assists making him the league’s triple crown leader (goals, assists, points). Lyle Thompson was equally effective with seven points on the night including a marvelous second quarter goal. While being dragged to the turf by three Calgary defenders, Thompson managed to get a shot off that eluded Calgary goalie Christian Del Bianco. With two weeks left in the NLL season, both teams will play their final game next Saturday and get a bye week going into the playoffs. Georgia (12-5) returns home to play the Philadelphia Wings (3-13), while Calgary (9-8) will host the Saskatchewan Rush (10-6).